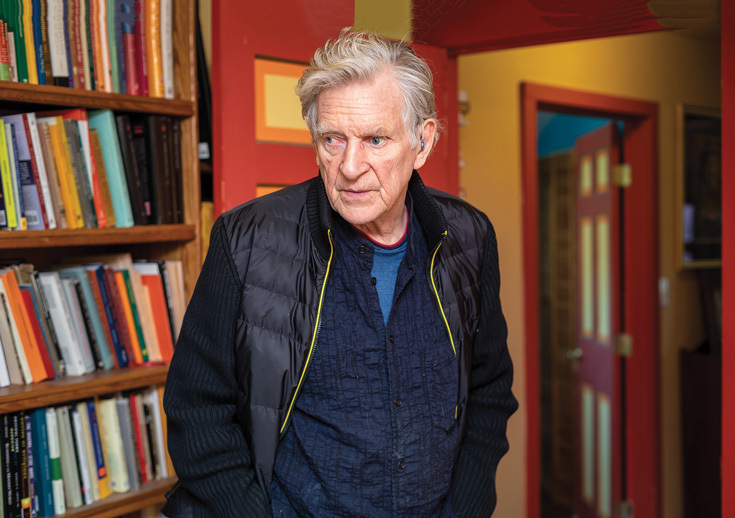 Renowned activist and scholar Robert Thurman can translate sutras, joke with the Dalai Lama, and call in a favor from George Lucas. Retirement, says Jennifer Keishin Armstrong, won’t slow this man down. 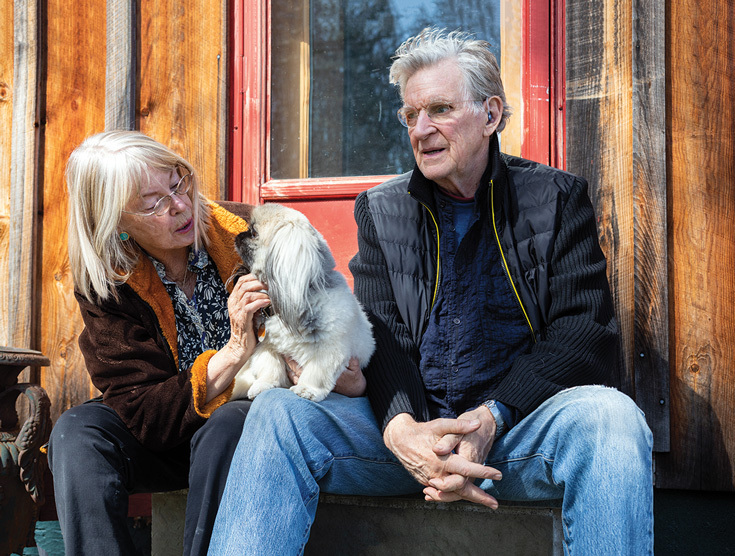 Nena and Robert Thurman (and their Pekingese Miko) at their home in Woodstock, New York. Once voted least likely to succeed by their friends, they’re the Buddhist power couple behind Tibet House U.S. and Menla Mountain Retreat. Photo by A. Jesse Jiryu Davis. A white marble statue of the Buddha, a crack across its smooth face and two fingers of its right hand missing thanks to an encounter with a candle years ago, presides over the fireplace in Robert and Nena Thurman’s charmingly Bohemian home in Woodstock, New York. The statue is special, Nena explains, because when the aforementioned candle toppled over, the statue did, too. And falling just so, so the story goes, it snuffed out the flame and saved their home, which is girded by visible wooden beams, from burning down. Robert points out another sacred statue in the living room—this one of Songtsen Gampo, the first Buddhist king of Tibet, depicted with a tiny second head on top of his own, to represent his guru. 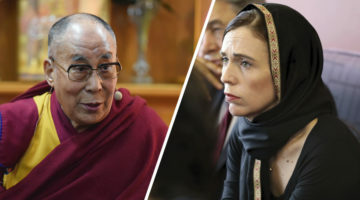 That was a gift from the Dalai Lama, who also happens to be a lifelong “buddy” of Robert’s and the man who in 1965 ordained him as the first American monk in the Tibetan tradition. To talk with Robert and Nena, who have been married for fifty-one years, is to hear many such stories. Particularly when it comes to the loquacious Robert, every knickknack, every thought, unlocks another thought, another story, each one as interesting, funny, or surprising as the next. It’s this charisma that has made him one of America’s most famous Buddhists and a rock star of a religious studies professor at Columbia University, where he has taught Indo-Tibetan studies for thirty years. The seventy-six-year-old, whose many books include Why the Dalai Lama Matters and a translation of the Tibetan Book of the Dead, is retiring from that storied career next year. But it’s hard to imagine him or Nena—as much his professional and spiritual partner as his wife—slowing down. They’ll still have Tibet House, their cultural center in New York City, and Menla, their Tibet-inspired spa and retreat facility in the Catskills, to keep them busy. The Thurmans’ abundant energy is apparent even as they do their version of relaxing. In their mountain home, on this sunny spring day, they enjoy goat cheese, rice crackers, and dandelion tea, while they trade reminders about life’s mundanities—picking up the car from the shop, the kids coming to visit—and Robert holds forth. About the future of Buddhism in America: we need more dharma knowledge, belief in past and future lives, and a stronger monastic tradition. About the Tibetan cause: he’s optimistic. And about secular mindfulness meditation centers: he’s cool with them. 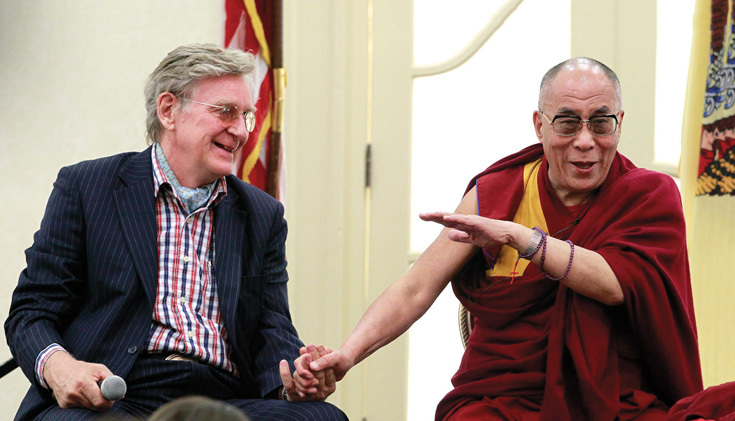 Friends and allies, Robert Thurman was twenty-three and the Dalai Lama was twenty-nine when they met. Robert certainly doesn’t mince words. 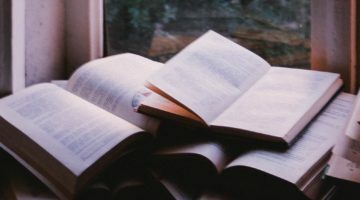 But it follows that a professor would passionately emphasize the dissemination of knowledge, and his contribution to spreading knowledge of the dharma goes beyond established Buddhist practitioners: his popular courses at Columbia have introduced Buddhist philosophy to thousands of students who might never have known about it otherwise. Robert’s charisma adds to his appeal as a professor, as do his Hollywood connections—one of his four children with Nena is the actress Uma Thurman, and he cofounded Tibet House with Richard Gere. “His undergraduate classes are packed,” Awn says. “He’s a dazzling lecturer. 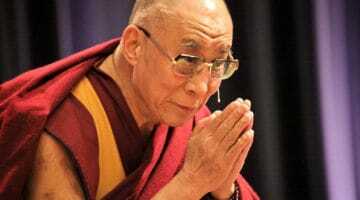 The Dalai Lama visits Tibet House U.S., which was founded at his request to help preserve Tibetan culture. 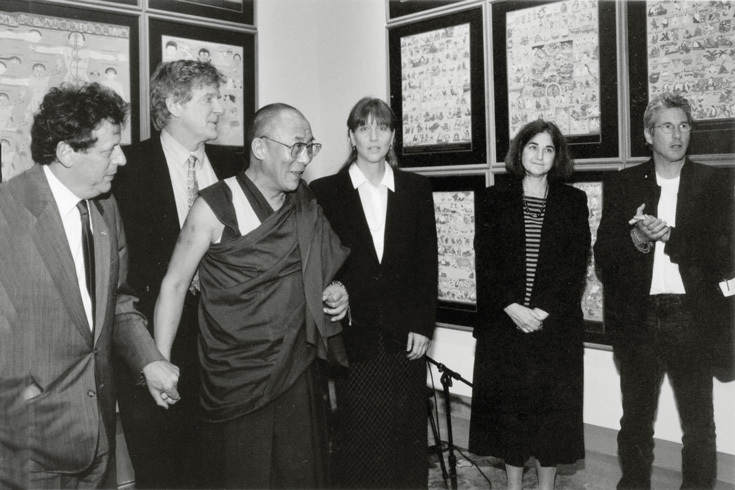 Left to right: Philip Glass, Robert Thurman, Elizabeth Avedon, Elsie Walker, and Richard Gere. Photo by Sonam Zoksang. Robert’s unique backstory has allowed him to be effective as a mainstream Buddhist voice and an impassioned advocate for Tibetans suffering under Chinese rule. But he can also make an intellectual argument for past and future lives, translate the Vimalakirti Sutra into English, give the Dalai Lama a good-natured ribbing, and call in a favor from George Lucas. 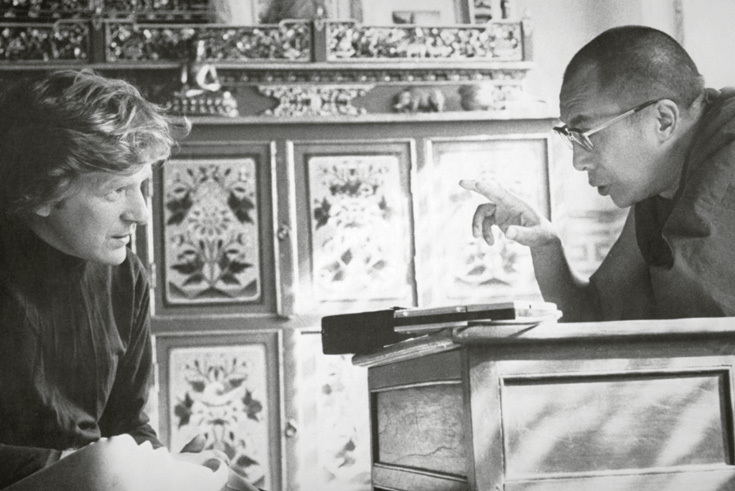 Robert’s warm relationship with the Dalai Lama has driven much of his career. It began in the 1960s when Robert’s first guru, New Jersey–based Mongolian lama Geshe Wangyal, introduced them. Versed in the Tibetan language and holding degrees from Harvard, Robert traveled to India to teach English and learn from the Dalai Lama. Geshe Wangyal warned that he believed Robert would never be a lifelong monk, but the Dalai Lama ordained Robert anyway. “He made me a monk, I think, to keep me there,” Robert says. When Robert returned to the States to get his PhD from Harvard, he impulsively named his area of studies “Buddhology” on his thesis form, deciding it was a more inclusive term than “Buddhist studies.” He wasn’t studying Buddhists from afar, as if they were part of a separate and alien culture; he was an expert in Buddhism from within. This would distinguish him among religious studies scholars of his time. Robert’s star power as an ambassador of Tibetan Buddhism in America began to grow in the late 1980s. He and Nena cofounded Tibet House with Richard Gere and composer Philip Glass in 1986 and he accepted his position at Columbia in 1988. In 1997, Time named Robert one of the twenty-five most influential Americans, calling him “the Billy Graham of American Buddhism.” The magazine cited the “glitziness” of his ambassadorship, but it should be known that he’s no-nonsense and welcoming, despite having a former model as a wife and an Oscar nominee as a daughter. 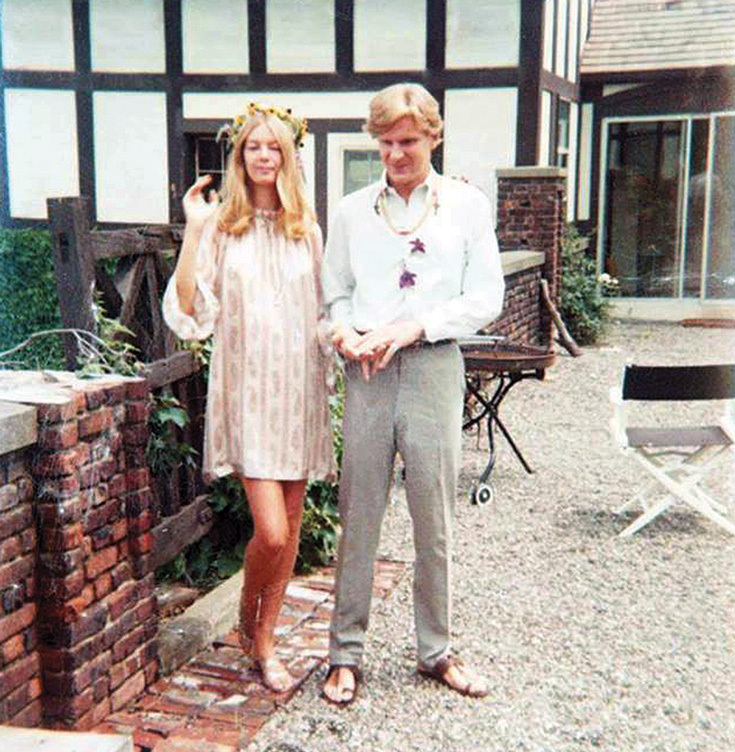 Famed model Nena von Schlebrügge and former monk Robert Thurman on their wedding day in 1967. Nena, in fact, appears to be a grounding force for Robert. He doesn’t regret giving up monasticism—and its celibacy—to marry her. “I learned so much from having a family and from my third main guru, my wife,” he says. Buddhism forged their relationship and has continued to be its driving force. “If you share spiritual aspiration, that is like a glue in a relationship,” Nena says, her Swedish accent evident. “When we first met, it was the thing that attracted me to Bob. He was so knowledgeable about Buddhist philosophy, and I had all these questions—perennial questions. I had been trying to have answers for years and years. With Bob I suddenly had someone who had answers, who had studied. We could have conversations. I found that the best answers could be found in Buddhist philosophy. It was a homecoming feeling.” Because of that shared spiritual commitment, she says, it seemed natural that they would share their lives and work, and that their work would grow out of Buddhism. That has materialized at storybook-perfect moments for the couple. They bought the property for their home in Woodstock with seven thousand dollars Nena had inherited in 1968, a year into their marriage—“from a fairy godmother in Europe,” Robert says. They were visiting Woodstock when Robert lost his car keys when he went for a swim. Stuck there for the weekend, they happened upon 9.5 acres for sale that they could afford; aside from the inheritance, they were otherwise “penniless—an ex-monk and an ex-model.” The property became the site of their home for the next five decades and counting. 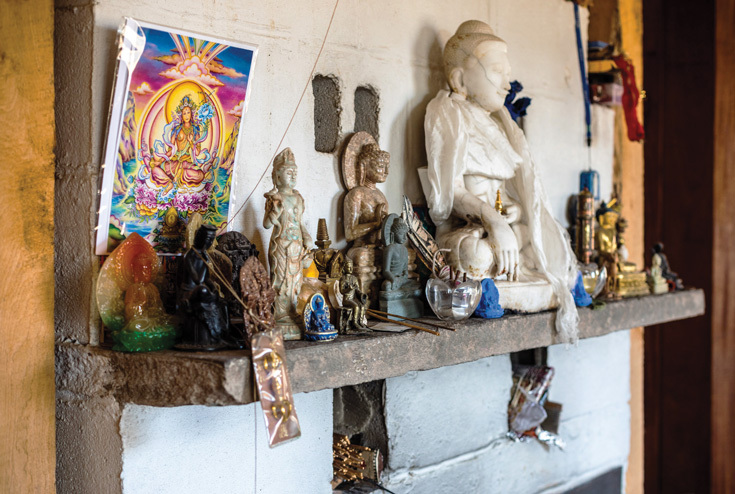 Images of buddhas, bodhisattvas, and gurus populate the Thurmans’ home. The large white marble buddha was cracked when it fell and, according to Nena, put out a fire that could have destroyed the house. Photo by A. Jesse Jiryu Davis. In 2002, the Catskills region produced another land gift for the Thurmans. During a pilgrimage to sacred Mount Kailash in Tibet, Nena met a woman who was part of a committee that had just purchased a facility in Phoenicia, New York—just twenty minutes from their place in Woodstock. Over time, it had been a hotel, a healing center, and a spiritual retreat, and now the committee was looking to give it to a worthy new cause. The Thurmans and Tibet House became that cause, and Menla was born. The Thurmans’ work with Menla dovetails with their dedication to the Dalai Lama and his homeland. Having spent decades working to free Tibet and preserve Tibetan culture, Robert is surprisingly optimistic about the region’s future. Under Chinese President Xi Jinping—whom Robert refers to as “emperor” because of his extreme power in the Communist country—he believes the country will “go back to classical Chinese culture.” That includes Buddhism. 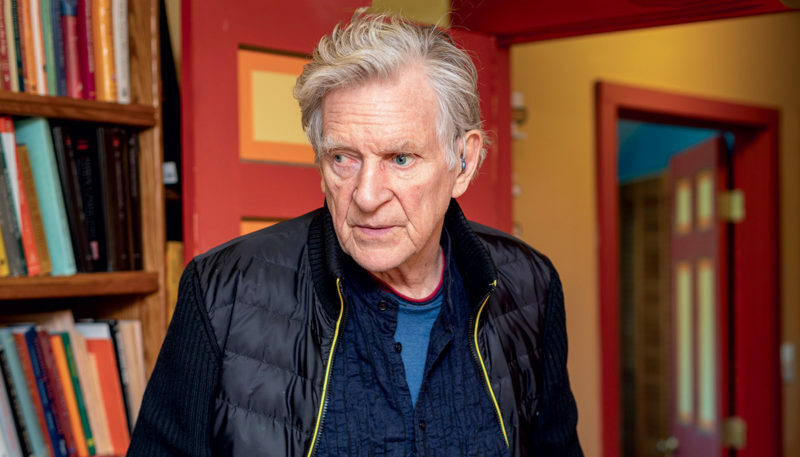 Robert Thurman is the author of many scholarly and popular books on Buddhism, Tibet, art, politics, and culture, including “Why the Dalai Lama Matters,” “The Central Philosophy of Tibet,” and “Love Your Enemies” (co-authored with Sharon Salzberg). Photo by A. Jesse Jiryu Davis. Robert’s most radical idea is his vision for Tibetan Buddhism in the West going forward. For it to truly flourish, he insists that two things must happen: an embrace of rebirth and a strong, celibate, monastic institution. And despite having given up his own monasticism for marriage, Robert believes that Tibetan Buddhism needs celibate monastics to grow in the modern West. He once believed that American Buddhism could survive on lay practitioners, but he changed his mind when he studied the U.S. peace movement of the sixties and seventies. “Seymour Melman gave a speech on the first Earth Day about the nuclear freeze movement,” Robert says. “He said, these marches are great, but you guys have day jobs and you do this in your spare time. The war industry has professional, lifelong careers and zillions of dollars in those careers. How are you really going to match that in the longer term?” Robert sees an obvious parallel in monasticism: Buddhism must have a strong institutional presence, with career practitioners, to root itself in America and counteract the prevailing destructive culture. That is, as long as you don’t consider Tibet House, Menla, years of fruitful activism, and thousands of students educated in Buddhism an empire. Let’s call it a karmic kingdom of Buddhology that’s not going anywhere, retirement or not.